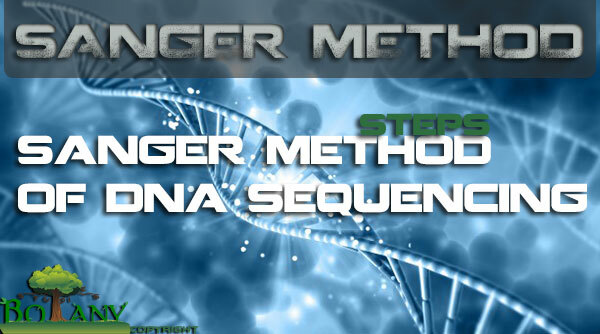 Sanger method of DNA sequencing is an in-vitro method, which involves in-vitro synthesis of DNA strand complementary to one of the strands of the DNA being sequenced. Sanger sequencing is utilized for determining the nucleotide sequence of DNA. This DNA sequencing method was developed by F. Sanger as the method name suggest it self. The DNA sequencing steps involves random addition of a modified nucleotide dideoxyribonucleotide, which lacks two oxygen atoms, and blocks DNA synthesis. A series of DNA fragments is synthesized which reflects all the positions of the modified nucleotides, and thus ultimately the sequence of the DNA. Before beginning the synthesis procedure, the DNA to be sequenced is cut up into restriction fragments. In first step of Sanger method, a preparation of one of the strands of the DNA fragment is divided into four portions, and each portion is incubated with all the ingredients needed for the synthesis of complementary strands, i.e., a radioactively labeled primer, DNA polymerase, and the four deoxyribonucleoside triphosphates. In addition each reaction mixture contains a different one of the four nucleotides in modified dideoxy (dd) form: dd ATP, dd CTP, dd TTP and dd GTP. In the second step of Sanger method of DNA sequencing, the synthesis of new strands starts with the primer and continues until a dideoxyribonucleotide is incorporated, which prevents further synthesis. Since the reaction mixture contains both deoxy and dideoxy forms of one nucleotide, the two forms “compete” for incorporation into the strand. Eventually a set of radioactive strands of various lengths will be generated. Now in the third step of Sanger DNA sequencing, the new DNA strands in each reaction mixture are separated by electrophoresis on a plyacrylamide gel, which can separate strands differing by as little as one nucleotide in length. 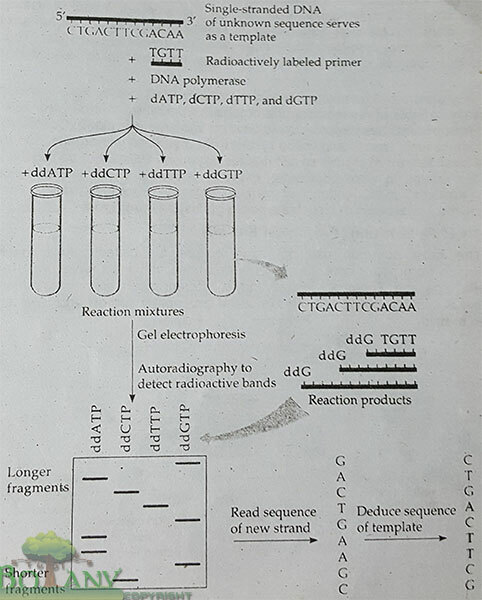 In fourth step Sanger method of DNA sequencing, the sequence of newly synthesized strands can be red directly from the band produced in the gel, and from that, the sequence of the original template strand is deduced. In the last step of Sanger technique, their is fragment termination. In the example illustrated in fig: 1.1, the longest fragment terminates with ddG, this means that G is the last base in the new DNA strand. The second longest fragment terminates with ddA, meaning that A is the second to last base, and so on.